The practicum is a crucial experience for student teachers, as it shapes their understanding of their role and identity as future teachers. In British Columbia, student teachers undergo three practicum periods over the school year: “immersion days” once a week from early in the school year; a two-week practicum mid-way through the year; and a 13−week “extended practicum” after the second university term. Cooperating teachers (also known as supervising teachers, sponsoring teachers, mentors, school advisors, etc.) are critical to the success of the practicum placements undertaken by every student teacher. They help their visiting teacher education students navigate the unfamiliar school environment, convey teaching skills, give feedback, and ideally support reflection on the profession. However, classroom teachers can be reluctant to take on a student teacher if they believe their teaching assignment is too demanding, the classroom too challenging, or their experience with a previous student teacher too difficult. Given this tension, it’s unfortunate that cooperating teachers are poorly prepared for their work with student teachers. Professional development for this role is almost non-existent and, in the absence of such support, cooperating teachers draw almost exclusively on their own past experience as student teachers themselves to guide their current advisory practices. The initial purpose of the project described in this article was to explore the challenges faced by cooperating teachers – who often feel that they lack preparation for their task of overseeing student teachers during their practicum – with an eye to identifying ways to better support them in this role. The University of British Columbia’s (UBC) Centre for Study of Teacher Education began its research with cooperating teachers back in 2003, with a project seeking to give “voice” to their concerns and experiences. In 2007, with funding provided by the Social Sciences and Humanities Research Council (SSHRC), the UBC project team started the “School Advisor Network” in the Richmond School District, where UBC places approximately 100 student teachers every year. Along with the four university instructors/researchers, an average of 12 teachers attended 19 monthly meetings over the course of two years, engaging in conversations about their roles as cooperating teachers. Participants included principals, vice principals and teachers who had between five and 29 years of student teacher mentoring experience. In the first meetings, the teachers talked about the challenges they faced as cooperating teachers. As there are no formal qualifications required to become a cooperating teacher, much depends on their own initiative, their understanding of the role and their motivation to mentor a student teacher. Cooperating teachers face a dilemma when inviting student teachers into their classroom: Their desire to foster the next generation of teachers is potentially in tension with their commitment to their pupils. Common problems raised by the cooperating teachers included challenges in meeting the particular learning needs of the teacher candidates, communicating with the teacher candidates and finding a proper way to reflect on their own practice and share it with a teacher candidate. Many found it difficult to establish a good relationship with the teacher candidate. Janet, an elementary school principal, noted that teacher candidates were often more willing to talk with each other than with their cooperating teachers. Teachers also felt a tension between a desire for guidelines for mentoring and the need to let the teacher candidates “do it their way.” While some thought guidelines such as a handbook would be useful, others rejected a one-size-fits-all approach. Integrating the supervising teachers’ role into the teacher education program. In a process that continued over several meetings, the group examined these topical themes further. At the ninth meeting of the group, one participant commented that given the welter of problems, “it was surprising that anyone would want to be a cooperating teacher.” Yet most of the participating teachers considered it a rewarding experience. As Tina, one of the participants, said, “Being a cooperating teacher is the best professional development I’ve ever had.” Thus began a second round, listing the potential motivators or rewarding aspects of working with student teachers. It became clear that a key motivator for volunteering to be a cooperating teacher is an increase in one’s own professional knowledge as a result of the interaction with someone who is learning to teach. Working with student teachers allowed cooperating teachers to think more deeply about their own teaching, to be exposed to new professional materials and to be given the opportunity to spend more time on lesson and unit planning. Cooperating teachers also place a high value on their engagement with the university as a result of working with student teachers, which constitutes a source of new knowledge. 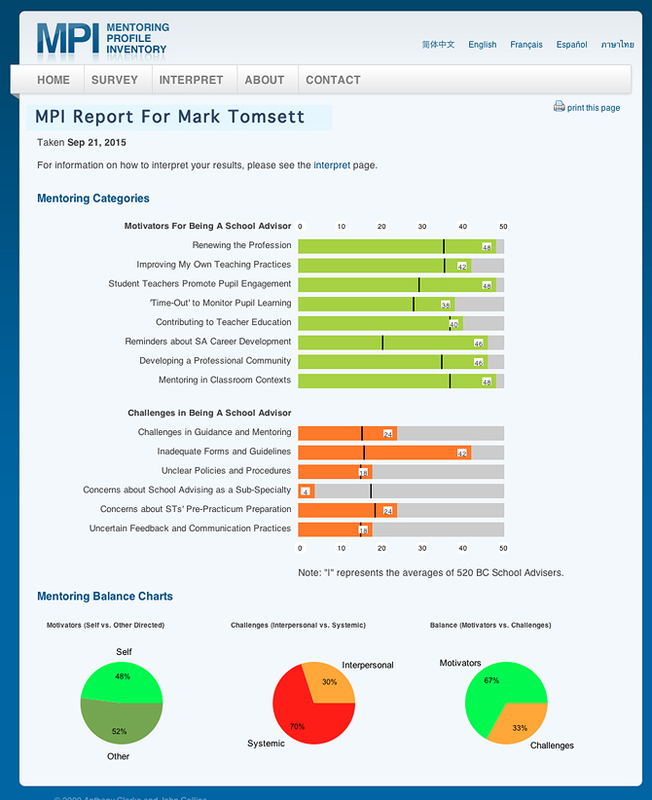 Based on the initial generation of approximately 200 topical statements, the network decided to develop a survey for cooperating teachers, which eventually became the Mentoring Profile Inventory Profile (MPI), available in five languages: Chinese, Thai, French, Spanish, and English (at www.mentoringprofile.com). It was built from the ground up with the teachers involved in virtually every step along the way. In 2009, the network circulated a first version of the survey among their colleagues in schools and also to anyone supervising a student teacher in the Richmond School District that year. Approximately 140 surveys were distributed and 106 were returned during the first external test of the survey. Based on these early returns, the survey was further refined, and we developed an online version of the survey. Since 2009, the UBC project team has received approximately 2,000 responses to the survey. While the MPI was constructed in Canada, its development occurred in collaboration with researchers from China, Thailand, Spain, and France to ensure that, as far as possible, the underlying concepts were relevant, consistent, and valid beyond the North American context. An analysis of the responses revealed that for Canadian respondents, the highest motivator for being a cooperating teacher is “mentoring in classroom contexts” (about 57 percent), followed by “contributing to teacher education” and “student teachers promote student engagement.” The Canadian cohort of cooperating teachers differs in a substantive way from the cohorts from Australia, China, New Zealand and Spain, all of whom regard “renewing the profession” as a high motivator for working with student teachers (around 60 percent); by contrast, the Canadians report this as being a relatively weak motivator (under 30 percent). Canadian respondents are also less likely to cite “reminders about career development” and “improving my own teaching practice” as major motivators. In terms of challenges, “interpersonal” challenges are considered greater than “systemic” challenges in their work with student teachers (approximately 57 percent versus 43 percent). The “interpersonal” score reflects challenges with communication, feedback, and other issues that arise from interpersonal relations when working as a cooperating teacher. The “systemic” score reflects a lack of clarity around procedural issues: policies or guidelines, evaluation forms, etc. Overall, the results show that cooperating teachers are more motivated than challenged. The MPI is a tool to support the professional development of cooperating teachers. It provides a prompt for reflecting upon one’s advisory practice and helps to problematize that practice. The MPI provides cooperating teachers with immediate feedback about how they conceive of and carry out their work with student teachers, with a particular focus on what is both motivating and challenging for them (see Figure 1). The combined MPI results of a cohort of cooperating teachers can be useful at an institutional level. For example, it may be useful for an institution to know if the challenges that cooperating teachers face are more interpersonal or systemic, thereby providing “a finger on the pulse” of the practicum. Further, the survey can be useful as a “needs assessment” tool when examining an existing program, as it can suggest areas where program improvements may be helpful or where better support is needed. Looking ahead, the MPI can assist in the comparative analyses of cooperating teachers across local, national and international boundaries and reveal shared values as well as differences. Model both the preparation for and the practice of teaching. Encourage student teacher reflection and don’t stop mentoring them once they have learned practical skills such as lesson planning and classroom management. Offer suggestions and observations from personal experience and share reflections about the teaching and learning process, for example in a joint-journaling exercise. Make the teacher candidates feel like “teachers” by treating them like professionals, for example, by introducing them as fellow teachers, clearing desk space, preparing a binder with information, giving them the opportunity to introduce themselves to the parents, etc. Inquiry is a defining feature of professional practice; therefore it is essential to inquire into your own mentoring practice. When cooperating teachers complete the MPI (at www. mentoringprofile.com) they automatically receive a simple single-page report depicting their results in an easy-to-read graphic form. Maren Elfert is a PhD candidate in the Department of Educational Studies at the University of British Columbia. Dr. Anthony Clarke is a Professor in the Department of Curriculum & Pedagogy at the University of British Columbia.